Do you feel like a number? Like you’re not heard? Do you have something to say, but you’re too afraid to grab a megaphone and head out to the townsquare? Screw having a blog — now there’s a new solution: a 25 foot tall robot that announces your thoughts to the world! 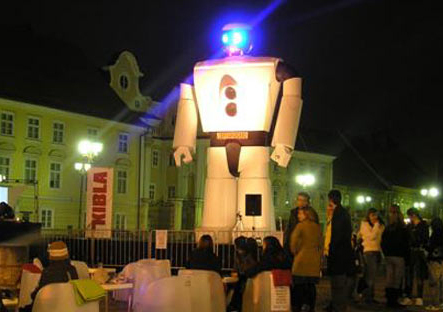 RoboVox is a unique public art installation traveling the world and being placed in public squares. When you text messages to RoboVox from your cellphone, he will shout them to the masses gathered at his feet in robot worship. Public squares used to be central places of social interaction and individual’s engagement in public life. Often, monuments were raised on these spots in order to symbolize and represent the political/ social state/ orientation of the country. Robovox is the first public monument which travels from country to country. At the same time, it activates public space into a place of communication, social interaction and playground. As a sculpture it symbolises active engagement in public life/ matters by giving you the opportunity to speak about public matters, to provoke debates and thus reflect the state of mind of each society. « Nar Ventures Back Into the Geekscape! It just occured to me that the price of PVC pipes isn’t really that high. And I do have a free week coming up.